Oscillations in the cytosolic calcium concentration ([Ca2+]i), in the form of repetitive spikes, may be stimulated by hormones or neurotransmitters in a variety of cell types, including hepatocytes, oocytes, cardiomyocytes and fibroblasts. It is generally accepted that the mechanism underlying these calcium oscillations is related to the calcium-induced calcium release (CICR) mechanism. Often, secondary messengers such as inositol 1,4,5-trisphosphate (IP3) are also involved. Calcium oscillations play a role in the regulation of cell excretion, muscle contraction, activation of mammalian oocytes, call signalling and other cellular activities. Keizer and Levine, RyR Adaptation and Ca2+ Oscillations, 1996. In the Marhl et al. 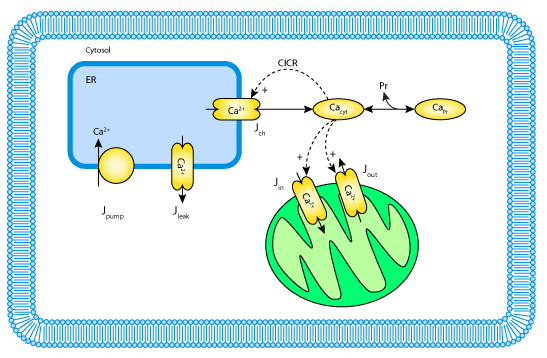 1997 publication described here, the authors present an electrochemical model which accounts for intracellular calcium oscillations and their interrelations with oscillations of the potential difference across the membrane of the endoplasmic reticulum (ER) or other inracellular calium stores (see the figure below). The model shows tht when a calcium buffering system such as calmodulin is included, calcium oscillations can arise without a permanent influx of calium into the cell. Schematic diagram of the model system. Derived from workspace Marhl, Schuster, Brumen, Heinrich, 1997 at changeset 1aca7bf80f50.